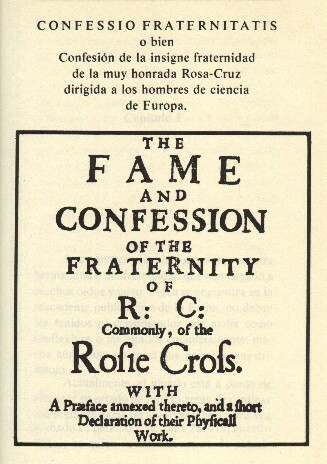 Included here is the text of the first Rosicrucian manifesto, the Fama Fraternitatis or, a DISCOVERY of the Fraternity of the Most Laudable Order of the Rosy Cross as translated by Thomas Vaughan (Eugenius Philalethes). This is version is presented as it was reprinted in the Rosicrucian Digest, Volume 82, number 1 published Spring 2004. The Confessio Fraternitatis is the second Roscrucian manifesto, published first in 1615 in Latin (along with the Consideratio brevis) and later that year in German. Although some English translation manuscript copies have been discoverd dating from the 1620's, a complete Engilsh version was not published till 1652. Thomas Vaughan, the alchemical writer translated this first english edition. The Chymical Wedding of Christian Rosenkreutz is the third Rosicrucian manifesto and written in a style that is very different from the two first Manifestos (The Fama Fraternitatis & the Confessio Fraternitatis). It describes a journey of initiation that represents the quest for Illumination. This seven-day journey mainly takes place in a mysterious castle where the Wedding of a king and a queen is to be celebrated. Symbolically the "Chymical Wedding" describes the spiritual progression bringing the Initiate to achieve union between his soul (the bride) and God (the groom). Your participation makes a world of difference! The official magazine of the Rosicrucian Order, the Rosicrucian Digest is a bi-annual magazine featuring informative articles on mysticism, philosophy, the sciences, and the arts. The magazine is given to members as part of their membership benefits, and is also available to the reading public on a subscription basis. Published continuously since 1915, the Digest is a truly unique magazine, and its carefully selected articles are of particular interest to Rosicrucians and their friends. How to submit an article to the Digest. 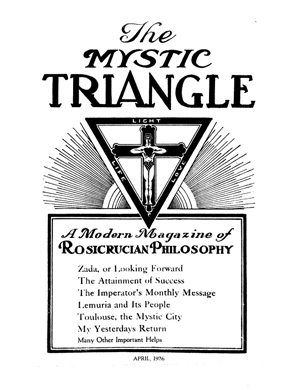 The Rosicrucian Digest was called the Mystic Triangle in early years. Read them here. 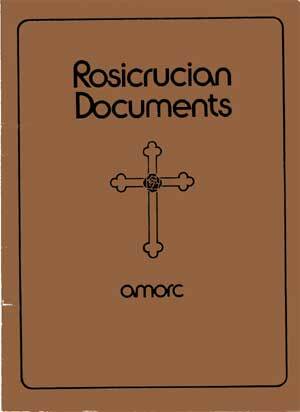 Prepared by the Supreme Grand Lodge of AMORC, this book contains reproductions of original documents referring to the authority, recognition, affiliation and administration of the Rosicrucian Order, AMORC. The complete collection of original documents are numerous and are currently stored in the archives of the Order. This book contains the most important and representive examples and is divided into the following sections: Averment; Authority & Organization; Affiliation; Recognition; Administration; and Honorable Mention.